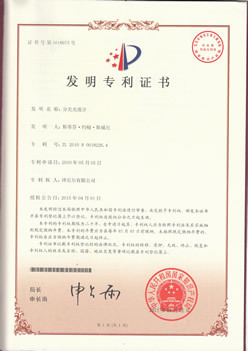 The State Intellectual Property Office of China (SIPO) has granted ZiNIR Ltd a patent (ZL201080018226.4) for its monolithic chip-based spectrometer/ concept. This patent was prosecuted in the Chinese National Phase of WO/2010/128325 based on the granted UK priority patent GB2470115 and was granted following a thorough and extensive examination by the SIPO patent examiners. It comes into force from today. Solo Spectroscopy offers a game-changing method of performing spectroscopy in which both the dispersion and detection of light occur within a single structure (a series of high-Q microdisk resonators arrayed along a waveguide). Each resonator is tuned to a specific wavelength and is made from active material so the amount of light coupled in the resonator is proportional to the amount of current generated. Since photons do not need to travel between a grating (or mirror) and a detector, the opportunity for stray light, the bugbear of many systems, is reduced leading to excellent spectral properties and, faster data acquisition from a robust minuscule chip. About Zinir: ZiNIR Ltd is a product development company based in Eastbourne, UK that translates leading photonics research into useful, flexible products for scientists and industry. ZiNIR's current research and development interests lie in the design of solid state spectrometers, detectors and light sources.